1 pass to 2, 2 short dribble while 1 overlaps to wing, 2 wide ball to 1 for a cross. 2 time run so you are attacking the cross for finish. May have to use cones to mark where you expect runs to be when first introducing BUT remove them as soon as players understand movement. Variation: Add a defender (light blue - next screen) who starts from penalty spot region. They can be passive in the first action and then add more pressure as desired. Players are divided into two teams, one team will start as the attacking team while the other will start as the defending team. Exercise start with one of the attacking players passing into the other player and makes an overlapping run around the team-mate to combine and play a 2v1 against the defending player. As soon as the first pass is made by the attacker, the defender comes into play to defend. If the defender wins the ball, he/she has a choice dribbling to the end line or shooting into the mini goals. After two minutes, the team change roles. 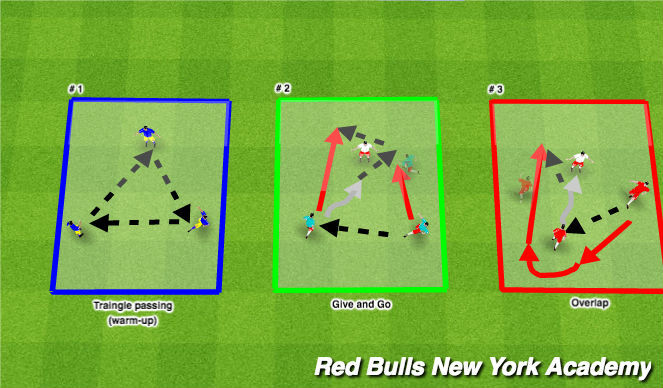 PLEASE NOTE: Field diagram only illustrates player movement while practicing combinations. Does not show actual field set up. 2. Coach introduces/reviews the Give and Go combo. 4. Coach introduces/reviews the Overlapping run. 1. Awareness: Observation of defenders position to help decide best course of action; Player in possession recognizing that space is ahead and they are able to drive in field to create 2v1; Timing of run of supporting player; Recognition of overlapping player to help unbalance defense. 2. Surface technique: Attacking 1st touch (Ronaldo) into space; Messi touches dribbling toward the defender; Inside/Outside surface to pass the ball. a. Recognizes space ahead / behind the defender and attacks the space with his/her first touch, engaging the defender 1v1. b. 1st Attacker engages 2nd Attacker by using verbal cues/commands to help combine and get around the defender by creating a favorable 2v1 situation. a. Recognizes 1st Attackers approach (physical cue) towards the defender in a 1v1 situation. 2nd Attacker decides to combine with the 1st Attacker by indicating a Give and Go combo, with his/her body movement, or an overlapping run by verbal commands to hold and pass the ball. Half field. 5v3+GK. Use cones to make two 5-yard gates. Attackers: #8, 9, 10, 2, 3. Defenders: #2, 4, 3. Coach always starts by playing #8. #8, 9, and 10 are instructed to stay narrow and direct. #2 and 3 look to overlap. 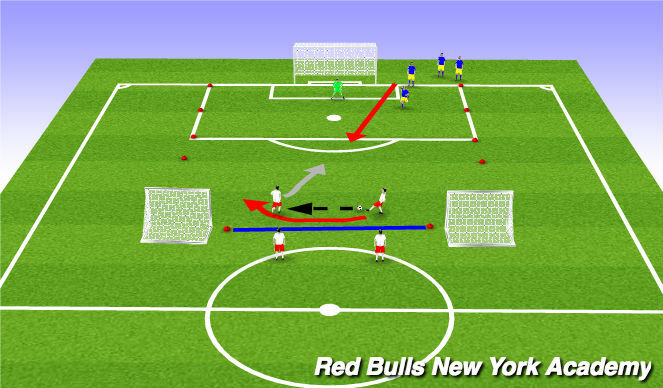 Defenders can score by recovering possession and passing through the red gates. -Team must have 2 players on shaded at all time for a goal to stand.